Saturday there is one college football game and it’s the only regular season game that has the right to stand alone. The Army – Navy game is not one where protester/Crybaby Kaepernick or any of the other sniveling, squirming, repulsive cowards of society will be attending, nor or they even wanted. This is America’s game, these players are on the field for the love of the game and they are at their schools for the love of their country. They are there to serve and we are to respect them. In this game, America will be celebrated, and honored. From the marching in of the Cadets and Midshipmen, to the prisoner exchange (where students from the opposing academies that are studying at the opposite school are sent back) to whoever gets to “Sing Second.” This game is rich in tradition, and honor and shows one of the best elements that makes this country so great. Last year, Army ended a 14- year winning streak by Navy. 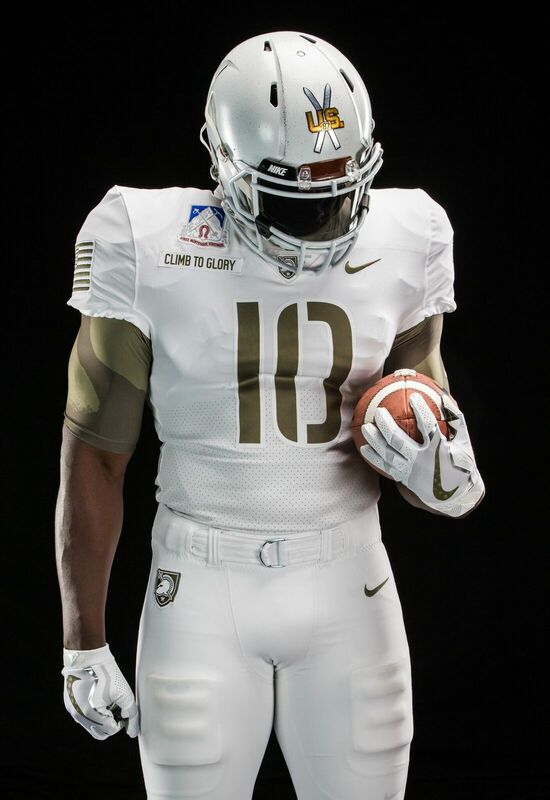 In that game the Black Knights wore uniforms that celebrated the 82nd Airborne Division of World War II, and the men in those black uniforms played one heck of a game, earning a victory of a lifetime. 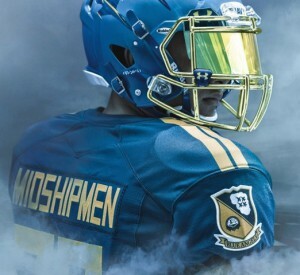 Navy picked up on the themed uniforms and this year will be wearing a uniform that celebrates their demonstration flying team, the Blue Angels. According to Navy’s Athletic Director Chet Gladchuk, “A special Navy uniform has become a statement in this game and brings with it appreciated meanings and clear messages that we are all in.” Navy should be ready. In a counter move, Army will be wearing an all white uniform with gold numbers and Crossed Skis on the helmets. These are “Climb to Glory” uniforms, honoring the 10th Mountain Division, that in WW II was trained to handle difficult alpine terrains. Even today, the 10th Mountain has faced difficult terrain in the mountainous regions of Afghanistan. I prefer honoring a battle-tested division over bowing even lower before the glory fly boys. In its last five games, Navy has gone 1-4, with their only win coming against SMU, 43-40. They started the year winning five straight, but then went on a losing streak that darned near cost them a bowl invite. They have struggled lately keeping it together as the game goes on. The Mids start off well, but in the third quarter they begin tapering off. This has not been the best season for the anchor-clankers, it’s almost as if they are missing something but can’t figure out what it is. They like to dominate time of possession, but they aren’t finishing well. Army, on the other hand, has the opposite story. The Cadets finished undefeated at home for the first time since 1996. They have won 8 games, – they did have a six game winning streak before losing their last game to North Texas on a last play of the game field goal. In several of the games the Black Knights have fallen behind only to battle back and take the lead. At times, their triple option attack has proven explosive, as in the North Texas game, which became a shootout, and the Cadets went toe to toe, trading scoring punches. The mood, the attitude and the entire outlook at West Point has taken on new life that can be infectious. The sports writers appear split on who’s going to win. They are giving Navy a 49.6% chance of winning, while Army has a 50.4% chance of victory. The Vegas oddsmakers are picking USMA as a three-point favorite, which is usually what they give the homefield team. However, this is a neutral field as it’s played in Philadelphia at Lincoln Field. Here at CigarSmokinFootball.com, we are not that whishy-washy. Since the start of the year we have been writing about Army and they’ve won. Why would we stop now? Army is our pick, Army is going to win, Go Army! Beat Navy! –Duh!